I took this little buck after getting to my hunting spot late at 9 am. As I climbed into my stand I saw white flags bounding away. Then 50 minutes later this little guy showed up with another one that looked like his twin. I took this buck with my Great Northern Critter Gitter, Arrow Dynamic Trad with 42gr adapter & 145gr Grizzly. Nice picture! Those look just like my arrows! Congratulations! Looks young enough to be mighty tender eating! aww yeah good eating there especially downed with the stick en string!!!!! 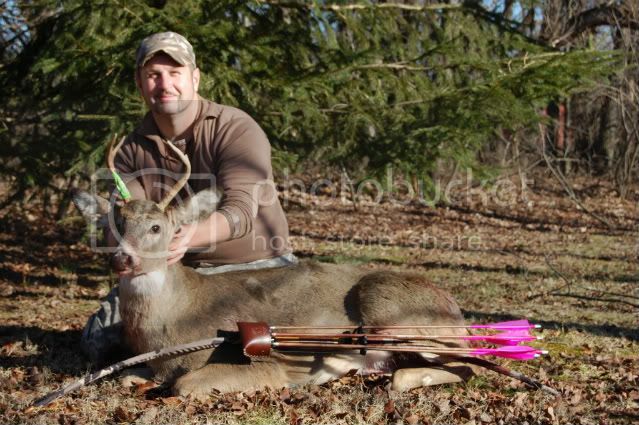 Congrats, nice deer, great picture. Nice work - That'll be some good eatin'! Late December in Michigan & Shirtsleeve weather! Congratulations on a nice looking buck! Great photo also!